In recognition of dedicated service to the Diocese of Joliet and the Archdiocese of Chicago, and to encourage the pursuit of lifelong learning, Lewis University is pleased to offer a 33 % tuition discount to diocese employees. In appreciation of dedicated service to the Lasallian Mission, Lewis University is pleased to offer tuition discounts to Lasallian organizations. Employees of Lasallian institutions will receive a 33% tuition discount. It is our hope that these tuition discounts will encourage them to pursue their higher education goals and become more effective contributors and leaders in our society. Employees and their dependents are eligible to apply. The tuition discount can be applied to graduate and adult undergraduate programs (excluding doctoral, select online graduate programs*, and traditional undergraduate programs). Employment verification by employer must be provided. 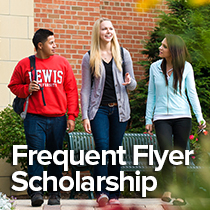 May not be used in combination with other Lewis University grant, scholarship or tuition discount programs. Applicant must meet program admission requirements. 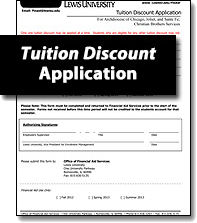 A Tuition Discount Application form must be submitted and approved prior to starting classes. Lewis reserves the right to cap the number of recipients in any given semester or program. *Discount does not apply to online master’s programs in Criminal Justice, data science, information security, organizational leadership, and public safety administration. As a Lasallian school, Montini Catholic High School has partnered with Lewis University to offer Montini alumni a 20% tuition discount on graduate and adult undergraduate programs. Must be an alumnus/nae of Montini Catholic High School. Discount may not be combined with any other Lewis tuition assistance, including grants or scholarships.